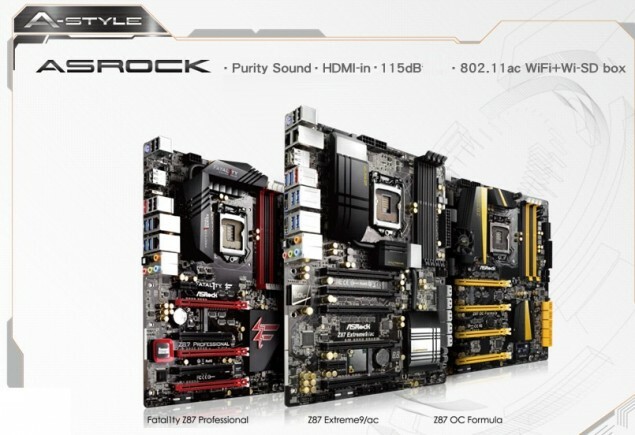 ASRock Z87 motherboards include their famous lineups such as the Extreme, Formula and Professional series boards. Today, we will be detailing the complete ASRock motherboard lineup which would launch alongside Intel’s Haswell platform on June 3rd 2013.
technology that allows for clear and high-quality audio for audiophiles. comes with solid state gold capacitors which offer better stability. 3.0 ports and a SD 3.0 card slot. Forgot to switch off your PC while heading out for work or a trip? include three PCI-e 3.0 x16, 1 PCI-e 3.0 x1 and 2 PCI legacy slots. ASRock’s A-PureStyle audio chip for high quality audio output. Next up is ASRock’s overclocking line of Formula Z87 motherboards that would include atleast three products – Z87 OC Formula/ac, Z87 OC Formula and Z87M OC Formula. display and several USB 3.0 ports for connectivity. for GPU/CPU, BClCK/Ratio settings, Voltages and CPU usage. The OLED should be a standard for all next generation motherboards. A live demonstration of the board’s A-Style Waterproof feature can be found here. be a bit low compared to the Z87 OC Formula. while the high-end Z87 Extreme 11 part is not revealed yet. the most basic features for overclockers. ports, HDMI, display port and several USB 3.0 ports for connectivity. memory with rated speeds upto 2666 MHz+ O.C. “Purity Sound” chip, Gigabit LAN and a PS/2 port. single PCI-e 3.0 x16 slot, three PCI-e 3.0 x1 and two PCI legacy slots. Storage is offered through 6 USB 3.0 connectors while I/O includes HDMI, VGA, DVI, 6 Channel Audio, Gigabit LAN interface.